One of the many common attributes you will see listed when reading through any mattress reviews or specifications is not just the name, brand, or material, but also the stated mattress thickness, which is sometimes specified as its height. Many people may mistakenly believe that the different mattress sizes correlate to their height, but this isn’t necessarily true – you can get thick Twin and thin Queen, and vice versa. In this article, we touch a little more briefly upon size. Mattress height plays a significant role in how the bed appears in the room. Will a new, different size mattress fit with the headboard and surrounding furnishings? If you are replacing the bed base and headboard at the same time as the mattress, what will the height difference be between the old and new beds? How would the new bed look in the room once it has been topped with bedspread or duvet, pillows? How about with extra layers of winter bedding and any additional cushions and finishing touches? These are all things to consider when buying or choosing a new mattress and when thinking about height, which is more controllable than the dimensions (length and width) of the required mattress itself. First and foremost we will start with the low profile types. These are between 2 and 5 inches high and are available in many constructions including blow up air beds and the space saving folding floor mattresses too. Mattresses like this are ideal for fitting in with a style of bedroom, usually a spacious, modern one – or simply for people who prefer a bed nearer to floor level. They are also useful to keep the overall height down if the foundation does double duty with drawers or storage space underneath. Bear in mind there may be compromises on comfort, particularly for heavier occupants. The slimmest conventional mattresses tend to be made of foam, as it’s the densest material. You will these days rarely find a very thin mattress made of spring. Indeed of the budget price range, these will feature plenty of foam mattresses, and some will evoke painful memories of bad nights on guest beds or campsites. Children’s beds and crib mattresses tend to be the thinnest. However, babies and kids aside, lightweight adult sleepers also won’t require all the support a heavy-duty pocket sprung mattress can give so, the thinnest foam mattresses may be an option for them. Regarding style, a low-slung bed frame often compliments a contemporary bedroom, especially with their clean lines, light woods and economic Scandinavian influenced design language. You may wish to accentuate the effect with a thin foam or spring mattress. In any case, a taller mattress with a depth of more than 18 inches or so may look out of proportion with the furniture. A standard sized or most typical mattress thickness for general use would be between 8 and 12 inches. 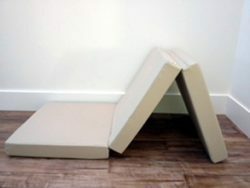 This size will be available in most of the usual constructions found on the market, i.e., spring, memory foam, and latex. Each material offers differing levels of firmness based on their material construction and specific characteristic, e.g., coil gauge (for spring mattresses), foam density in lbs (for memory foam mattresses) or type of processing method (for latex mattresses). Mattresses of this height tend to be more expensive than a thin mattress because they are often made up of numerous layers which pile up the height quite easily, however, regarding buy-ability, these are a popular size/height because they tend to fall in a mid-price range. Prices are also driven lower for the consumer due to lower postage costs for the seller, as this is a common height that can easily be shipped boxed and vacuum rolled. Generally, standard widths/heights of bed linen will fit without having to allow for extra depth. 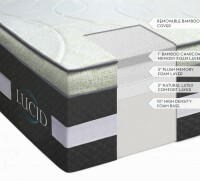 Medium to thick mattress heights above 12 inches are typical for all types of mattresses. These tend to be the most purchase worthy quality and widespread online and in showrooms. Many of the mattress reviews featured on this website are between 12 – 18 inches thick and are made of different materials. Some are single or dual material structured all the way through, while others consist of multiple layers of different material which add inches upon inches to build up comfort, thus resulting in combined thickness. Mattresses of this height are usually more expensive than any of those mentioned earlier but are also the type to have the highest reductions when sales occur. A thick mattress around 20 inches and above may be a legacy of a time of less advanced technology, materials, and construction. They fit in well in a country retreat setting, suiting the proportions of substantial bed bases and traditional, imposing bedroom furniture. The tallest mattresses over 25 inches bring to mind traditional, opulent styles of bedroom decor, with a taller bed more prominent in the room. They can evoke Tudor, Queen Anne or a country house style, even four-posters and royal bedchambers, and a certain decadence and luxury. These are less common in the broader marketplace and showrooms; however, they do exist and can be costly to buy. Another thing to bear in mind is these will not be shipped boxed, or vacuum rolled due to their thick nature and inability to be rolled. Another factor to consider is the low availability of bed sheets to match the deep design. 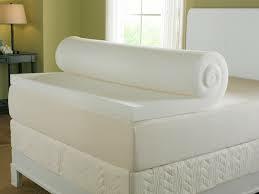 Mattress toppers are a cheap and cost-effective alternative to the conventional mattresses mentioned above. They come in thicknesses up to 4 inches and are worth considering as an option for making fine adjustments to bed height or comfort. They can easily upgrade the firmness and feel of a mattress, add features such as memory foam or reinforced support for pressure points, and protect against permanent mattress damage courtesy of pets or small children. These are available off-the-shelf in many department stores in the US and equally abundant online for home delivery. The combined height of a bed base and its mattress for many people is naturally vital for comfort and ease of access. A low bed may tempt you that you can literally dive into, or perhaps fancy climbing up into it. Sufferers of back pain or mobility issues will favor a bed that’s around comfortable sitting height, 24 to 30 inches off the floor. However, mattress height is not just about accessibility or aesthetics; it is mostly to do with the inner construction and design which has been chosen to.